WordPress is the most popular choice when it comes to content management online and it also happens to be what powers 27.7% of the total websites you see on the internet. It is also highly likely that your fashion blog or favorite news blog uses WP. Why? Because it happens to be the best in the game. People often wonder what it is they are supposed to do after starting a blog. 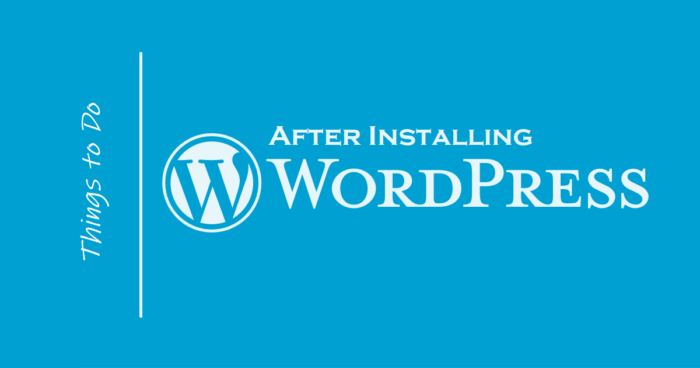 Yes, the things that lead up to starting a blog are important, but the real deal starts once the blog is initiated and WordPress is installed. Simply installing it doesn’t mean your job is done. There are a few immediate steps that you are supposed to take after the installation process. Don’t fret, we will give you the basics of WordPress hosting info in the top 10 things you should immediately do after installation. Every website on the internet requires a contact form. This is something that gives your online visitors to immediately contact you. All they have to do is fill out a form on your website. As a part of WordPress’s default settings, there are no built-in contact forms for you to use. This is where we recommend you take help from WPForms. This is a WordPress contact form plugin that you can easily install and create your very own original contact forms for your website. WPForms have free versions that you can download through WordPress’s plugin repository. The next step is to change the tagline, site title and time zone. All you need to do is head to the Settings > General page and then modify the settings. Search engine optimization is not everyone’s tea. If you are fairly new to it, we recommend you read up on what it is first. After doing that, you can finally use it to generate more traffic towards your website through major search engines like Google, Bing, Yahoo and more. WordPress happens to be incredibly SEO friendly which is good news for you. Therefore, there are many options for you to toggle around with to optimize your website. Believe us, the more options you have, the better. The ideal time to set up SEO is right after you install WordPress. We recommend that you use the most popular SEO plugin out there by the name of Yoast. This is a highly comprehensive SEO plugin that will go a long way for your web hosting needs. It offers you important SEO settings as well as the ones that are out of the box. As a website owner, you need to know what your audience demographic is, what they are looking for and how you can help them achieve it. Knowing this kind of thing can help you make much smarter decisions in the business world. This is where Google Analytics comes into play. This plugin shows you the number of visitors you get on your website, what part of the world they are from, and exactly what they did on your website. You can easily download Google Analytics by using MonsterInsights which is a great WordPress plugin that gives you important insights right within WordPress. Studies suggest that something as insignificant as 1 second delay in page load time can lead to an estimated & percent loss in conversation, 16 percent loss in customer satisfaction and 11 percent loss in page views. When you own a website, it is your job to ensure that your website is functioning excellently even during high traffic. This is where you need to think about caching. Caching gives your website a chance to be quick in serving cached copies of the webpage to users instead of creating them on the go. This ends up reducing overall server load of your website, thereby improving your page load time. There are several plugins that can allow you to do this but we recommend WP Super Cache & WP-Rocket (Premium One). This plugin will improve your website speed and make it more satisfactory for your visitors. Every year, people lose millions of dollars in damages due to data loss. It is essential for you to set up backups, or your website will be in trouble at one point or another in the future. WordPress offers you a variety of backup services with the web hosting plans it offers. However, they simply cannot be trusted long term. We suggest you download WP plugins such as Updraft Plus, BackupBuddy (Premium One) which is the most popular backup choice for daily scheduled backups. You can upload your data onto Google Drive, Dropbox, Amazon S3 and many more. WordPress is pretty secure but there are a few precautions you need to take to absolutely ensure your website’s safety online. One of them would have to be investing in a VPN to prevent unwarranted hacking. The next step would be to download plugins such as Sucuri which can provide you a secure WordPress firewall that blocks malicious content from finding its way into your website. Spam comments can be a bigger problem than you think. Most spam comments contain links to malicious websites that distribute malware if clicked on. This can end up ruining your website’s overall ranking online. We recommend that you enable comment moderation from your dashboard to prevent any comment from being posted without your approval. This will control the quality of content on your website. You can also activate the Aksimet plugin that will an anti-spam plugin that is built-in WordPress. Go to Appearance > Themes page and click on any theme that you want. This will open some details about the theme. At the bottom right corner of this particular popup, you will find the delete option. Click on it and you’re done. In any blog, comments play a big role. When a user visits your website, the number of comments you have on your posts can be a big indicator of how successful your blog is. It will help build the visitor’s confidence in you. All you need to do is go to Settings > Discussions page and then set up the comments. Here you will get a variety of settings to modify such as disabling comments, enabling comment moderation, and setting up comment notifications. Setting WordPress up the right way can pave the way into generating a lot of audience for your blog or business. You know what a large number of audience means, it means more sales and who doesn’t like more sales online? Follow our guide religiously and get all the necessary settings straight, and you can be on your way towards attracting visitors the right way. But remember, the quality of your content is also very important. Once you get visitors onto your website, it is the quality of content that you post that is responsible for keeping the visitors come back for more. Very well compiled steps for setting up a website and making practically efficient. Keep up the good work.